The three people who were praying inside had left the Edson Mosque, about 200 kilometres west of Edmonton, and were still in the parking lot when the fire started at the building's south entrance at around 11 p.m. local time. Mosque security camera footage captured the flames as well as a person in a dark hoodie leaving the property with what appears to be a red jerrycan. Firefighters arrived 15 minutes after the fire started and extinguished it, said Tufik Baterdouk, vice-president of the Islamic Society of Edson. The fire occurred a day after Eid al-Fitr, the Muslim celebration that marks the end of Ramadan, a holy month of fasting. It left soot and scorch marks on the exterior of the building, which was built five years ago using fire-resistant material. Baterdouk, who has lived in Edson for 26 years, said he feels disappointed and shocked someone would act violently against his community. He called the fire an attack, and said it's the only one that has happened at the mosque since it opened in 2013. "Having grown up here, I would not have thought that something like this would happen in a good town like our town," Baterdouk said. "This is something that we will have to explain to our children ... that kind of weighs on your mind. Probably the hardest thing is having to try to explain to children why something like this could have happened." Some 15 families visit the mosque regularly, he said. The National Council of Canadian Muslims called it a "cowardly act of arson against a mosque." 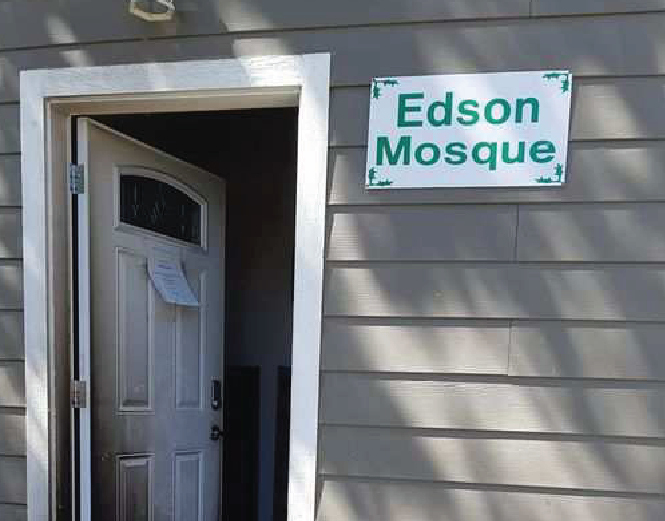 "We are relieved no one was hurt in the attack and we stand in solidarity with the entire Edson mosque community at this difficult time," executive director Ihsaan Gardee said in a news release Sunday. "A clear message needs to be sent that such vile actions that threaten communities will not go unpunished." Ahmed Hussen, Minister of Immigration, Refugees and Citizenship, said in a tweet that Canadians "stand together with the community against this brazen act." Very concerned about last night's fire at the Edson mosque. Canadians stand together with the community against this brazen act. Everyone in Canada has the right to practice their faith without fear. In a news release, Adil Hasan, vice-president of civic engagement for the Alberta Muslim Public Affairs Council, said: "Given that people were praying evening prayers shortly before the fire was lit, we cannot help but remember the Quebec mosque shooting" in January 2017. "While we are thankful that there were no injuries or loss of life, the Muslim community in Alberta is shaken and appalled by this arson attack. We expect a full investigation from the RCMP to bring the perpetrator of this heinous attack to justice. Finally, we call on the federal, provincial government to do more to counter Islamophobia and racism". The society won't be treating the fire as a hate crime until police share more information, she said. In a news release Sunday, RCMP spokesperson Sgt. Marlene Brown said the incident is suspicious and officers are investigating it as arson. "The structure did not become fully engulfed and only minor damage occurred to the structure," Brown said. Anyone with information about the fire is asked to call Edson RCMP at 780-723-8800.